After two very impressive albums (Head of the Deceiver and Odin), I eagerly anticipated this band’s new album. Unfortunately, Magic Circle leaves me extremely under whelmed. Their last album, 2003’s Odin was the band's career moment in my opinion. 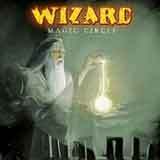 Magic Circle seems to be a huge step backward to me. With the help of Piet Sielck, Wizard finally achieved top notch sound quality with Odin. The first thing I noticed about Magic Circle is that the production and overall sound has regressed to the raw and unpolished level found early in the band’s career. That’s not such a big deal to me compared to the substance of the songs themselves. I, like most fans I would guess, can overlook production issues so long as the song quality is excellent. Well, the band has regressed in that area as well. After going through this album several times, I really can’t identify one or more songs that really grab me and demand multiple listens. Wizard is still playing their brand of heavy metal mixed with power metal elements, just not to the level they have for the past couple albums. Magic Circle just passes by without much fanfare or anything to get excited about. I just don’t forsee this album having any lasting value at all. Despite the tone of what I’m saying here, I want to make it clear that Magic Circle doesn’t contain bad material. It’s just that the album is surprisingly mediocre to fair, especially when compared against their past two releases. The melodies aren’t as strong, the guitar work sounds watered down, especially when compared to Odin, and the sound quality isn’t as strong as I have mentioned before. When you add that all together, the album as a whole simply pales in comparison to what I expected from the guys. As far as the guitar work goes, serviceable riffs and solos can be found, but they’re not to a level that would demand repeated listens. I found the lead and rhythm guitar parts to be especially weak and unimaginative. The harmony vocals on Odin had that “Piet Sielck sound” to them. Without Piet’s help on this album, the harmony vocals are raw and very thin, failing to add any color to the songs. For a new band on the scene, I would label Magic Circle as a promising album that has its moments, yet still indicative of a band that needs to keep improving. As you can imagine, releasing an album such as this after a couple of great albums like Head of the Deceiver and especially Odin, I am left pretty disappointed. This isn’t a bad album, but releasing a fair album after a top notch effort like Odin makes is sound worse than it actually is.